As the Indianapolis Colts mounted an improbable run to the playoff this past season, one of the players who emerged as a surprise catalyst was cornerback Pierre Desir, who had the best year of his career and became the team’s top cornerback. Desir is a gifted athlete. He has a lean 6-foot-1 frame and is just shy of 200 pounds. Cornerbacks have to be fast enough to keep up with wide receivers and quick enough to anticipate their cuts and turns. Some players have to overcome physical shortcomings — they don’t have all the speed and strength scouts want to see — but the obstacles were a little different for Desir, a Port-au Prince, Haiti, native who popped around small college football teams and worked odd jobs to support his family. A talented football player — he was an all-state selection at Francis Howell Central High School in Cottleville, Missouri — Desir had a good opportunity to go to a high-profile college program on scholarship, where he would have gotten better exposure to NFL scouts. But academics relegated him to Division II Washburn University in Topeka, Kansas, where he played receiver before moving to cornerback. After three years at Washburn, Desir transferred to another Division II program, Lindenwood University in Saint Charles, Missouri. NCAA transfer rules made him sit out a year when he transferred, so Desir took up different odd jobs in that down time to support his struggling family. He went to a temp agency every morning at 6 a.m. hoping work would be available. When it wasn’t, he went home and tried the next day. When work did come, it was usually jobs in construction or picking up trash off the roads. Desir racked up awards in his single season at Lindenwood, including being the first defensive player in school history to earn All-American honors from the American Football Coaches Association. The Cleveland Browns selected Desir in the fourth round of the 2014 NFL draft. He also played a season with the San Diego Chargers before the Colts claimed him off waivers from the Seattle Seahawks in 2017. 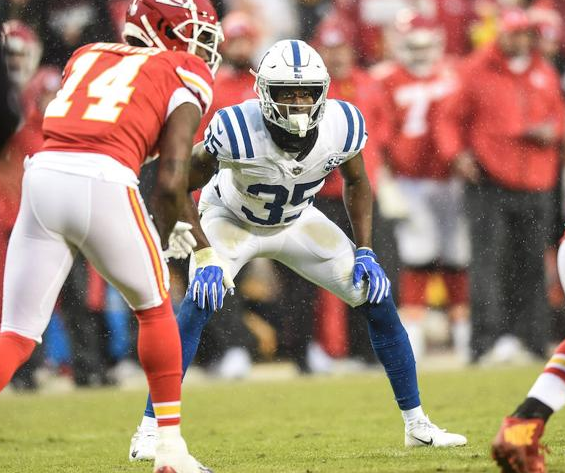 In his fifth NFL season and second with the Colts, Desir recorded career-high marks in games played (16), games started (12), total tackles (60), passes defended (nine) and forced fumbles (two). Desir was part of a Colts defense that embraced the “bend, don’t break” model, giving up short chunks of yardage here and there, but hardly ever allowing the big play. And as an unlikely star on an unlikely playoff team, Desir often matched up against the opponents’ best receivers, giving him an even steeper challenge on the field. Now an established NFL cornerback who will become an unrestricted free agent in March, Desir has a lot to be playing for. That includes his home Haiti. Contact staff writer Tyler Fenwick at 317-762-7853. Follow him on Twitter @Ty_Fenwick. ← As crisis in Venezuela escalates, Caribbean nations take sides, Haiti joins U.S.